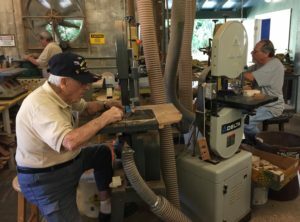 World War II veteran, Thad Pollard, (left in cap) and his son Gary Pollard (right) managed to break a Toymakers of East Lake record Saturday by cutting out over 500 wooden toys on the bandsaws. Toymakers is an all volunteer organization that will make and donate over 14,000 toys to sick and needy children this year. Thad served in the Seabees in WWII and to this day maintains their motto: “The difficult we do now, the impossible takes a little longer”. Thad and Gary exemplify the energy and commitment shared by this wonderful group of volunteers ranging in age from 13 to 97. We are honored to have three WWII Vets of the Greatest Generation. Here you can see why! Bob Helms has been President of ToyMakers of East Lake since January of 2011. Formerly Chairman and CEO of Pegasus TransTech, Bob was the 2016 recipient of the Millennium Sertoma Club's "Service To Mankind" award. In 2013 he was named Tampa Bay's Chamber of Commerce "Outstanding Leader of the Year" and was also recognized as a Bay News 9 "Every Day Hero" for his work with ToyMakers of East Lake.